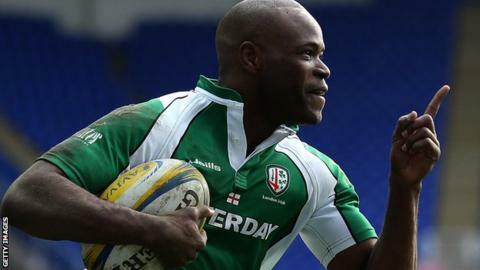 London Irish winger Topsy Ojo admitted his 250th appearance for the club was a "pretty emotional" experience. Ojo, 30, helped Irish to a crucial 20-13 victory against fellow Premiership strugglers Worcester on Sunday that lifted them off the foot of the table. The former England back almost added to his club record try tally only for a second-half effort to be overturned. "It was a really special day for myself and my family and it was nice to share with them," Ojo told BBC Sport. Ojo, who graduated from the club's academy before making his senior debut in October 2005, received a standing ovation before kick-off as he took the field with his son Noah. "I knew that was coming and I was looking forward to it," he said. "But, then there's the game that follows and that's on your mind as well. "But, it was important as you don't get to share moments like that too often with your family. I really enjoyed it and hopefully Noah did as well." Ojo appeared to have scored the 72nd try of his career in the second half, but referee Wayne Barnes and the television match official eventually disallowed it for an earlier obstruction. "I'll have to have a word with Mr Barnes," he joked. "I think he definitely owes me a beer. It was one of those where you see them let go and given. "Unfortunately, it wasn't to be the fairytale, but most importantly we got the four points." Irish's victory was only their third of the season and moved them above Newcastle, who have won twice. Worcester are a point above them in 10th place, courtesy of their losing bonus point.